What is a marketing plan? A marketing plan is a document that details the marketing strategies and tactics of a business. It is often part of a business plan, but it can also stand as a document on its own. A well-written marketing plan with a solid business strategy is beneficial to a business as it helps in the promotion of the business so that it can be known. If you do not have a marketing plan for your business, then your business will not be known and you will not have customers to support and buy the products and services that you offer. This is one of the many reasons why a marketing plan is important. Several music marketing plan templates are provided in this article that you can use to hep you create your own marketing plan. There are foundations who support artists and musicians to help them become known in the music business industry. This music marketing plan by Factor is a very useful marketing plan template that can be used by other foundations to help promote artists in the music industry. The template is simple and provides tips and general guidelines on how the template should be used. 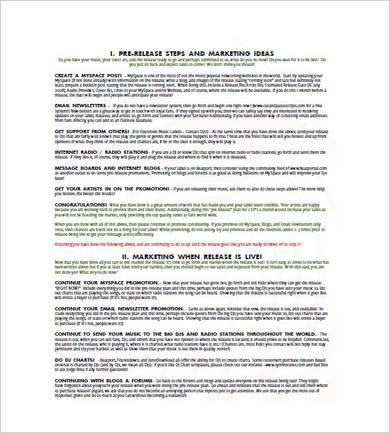 The entire marketing plan is only three pages long and includes details, like artist overview, album details, tracklisting, target market, etc. You can’t just rely on talent alone, especially if you want to become a successful artist in the music industry. 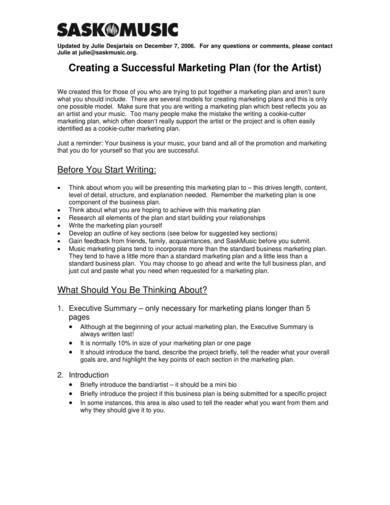 A well-written marketing plan is one of the things you need to be successful and the best marketing plan to use is this successful artist marketing plan template. The plan has been created to help those artists who need to create a marketing plan but don’t know exactly what to include. 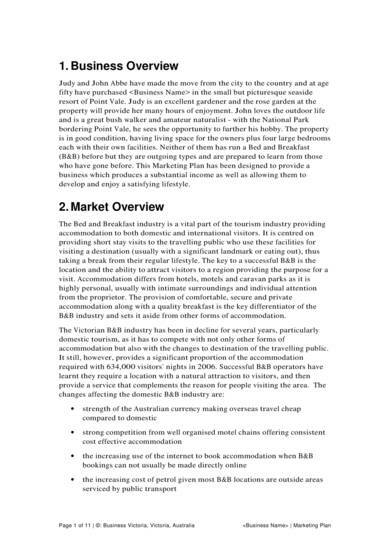 The template provides detailed instructions on the different sections of a marketing plan as well as what type of information to include in each section. 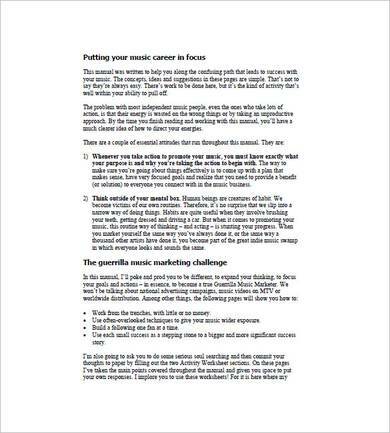 This musician’s do-it-yourself marketing plan template is perfect for those musicians and artists who are not under any music company or those who want to promote their music on their own. The template includes a lot of pictures for inspiration and the contents are made easier to read and understand. 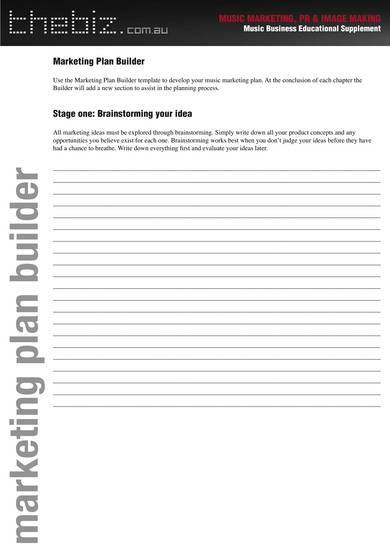 Who says creating a marketing plan is difficult if you have a DIY marketing plan template available for use. Want to promote your music business? 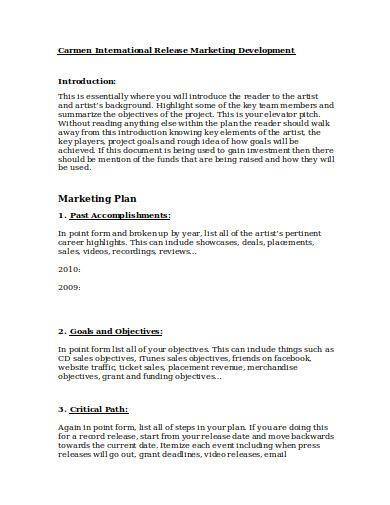 Then this music business marketing plan template is what you will need to get started. The template includes a title page where you can clearly write the name of your business together with your business logo and business address. 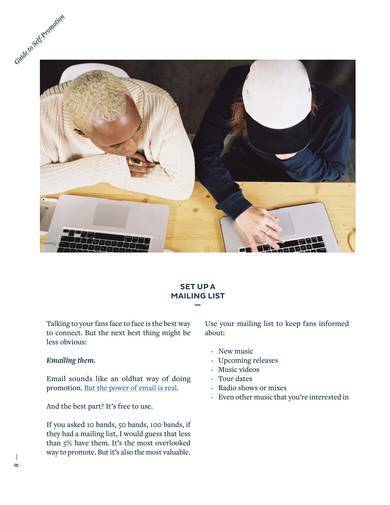 Use this template either as your own or as a reference to help you write a detailed and well-written marketing business plan. 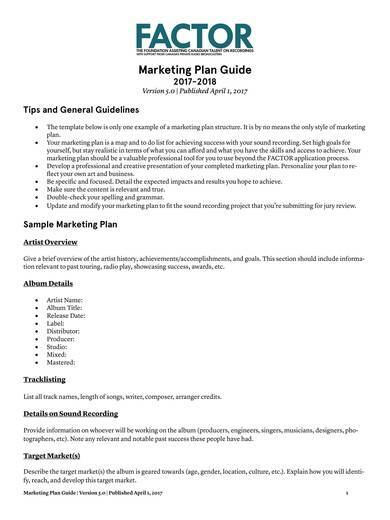 If a simple yet attractive marketing plan is what you are looking for to sell your music and make your career known, without a doubt what you are looking for is this performing artist music marketing plan template. The plan outline only consists of four sections and a brief description is provided for each section. Tips on how you can promote yourself on the radio, press, or video are also provided. Promote your album using a marketing plan that has a good marketing strategy. This music album marketing plan template focuses on advertising and selling your album online using a basic social media strategy that works. This way your album will be seen by millions of social media users and internet users. Step-by-step instructions are provided that will surely help you both in creating the plan and in implementing it as well. It is indeed very easy to use this editable music marketing plan template, which is available in Word. The template consists of six full pages and uses a simple layout that is easy to read and follow. The different sections in the template are numbered, underlined, and written in bold so that it can be easily distinguished from the rest of the texts in the document. The instructions are also detailed to help you create the appropriate content for your marketing plan. You will find these instructions provided in each section of the marketing plan. Why should you use an online music marketing plan template? One of the fastest and easiest way to get your passion for music recognized is by advertising and marketing it online. So you should use an online music marketing plan template to get your music known and attract many listeners. There is nothing more exciting than a free music marketing plan template that you can use to create your marketing plan to promote your music. This blank template is definitely what you need to get started and come up with an effective and useful plan without having to spend extra. The basics are always are favorite because they work just like the upgraded ones and they have proven their worth. 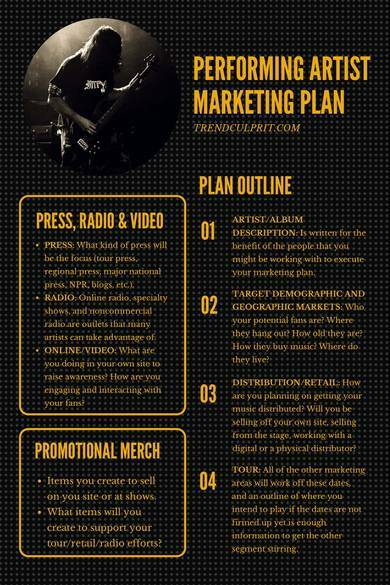 And when it comes to marketing plan templates, your best choice is this basic music marketing plan template. This template includes steps to help you with pre-releasing your music and some useful marketing ideas. 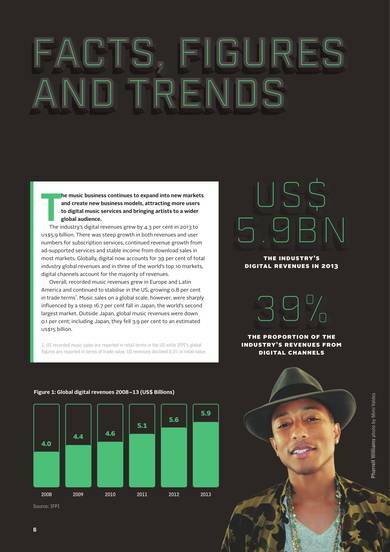 Want to go digital? 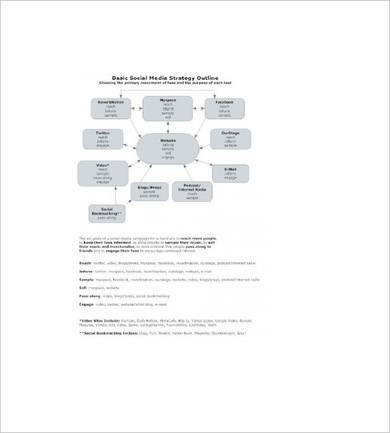 Then use this digital music marketing plan template. The entire marketing plan uses a very unique design and layout that will truly attract every reader. Reading it makes you feel like reading a magazine more than a marketing plan. Use any of these templates to help you create a music marketing plan that works best for you and that is appropriate for your needs. Other marketing plans that you may also find useful, include strategic marketing plan templates and event marketing plan templates.